Etienne Dupuch Jr Publications Ltd is pleased to announce the release of the January-June 2015 issue of The Bahamas Investor magazine. A priceless tool for anyone looking to invest, work or live in The Bahamas, The Bahamas Investor strives to bring the most pertinent, up-to-date information from the jurisdiction. 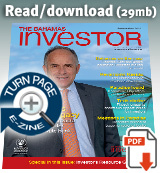 New digital issue of The Bahamas Investor Magazine is online now! The January-June issue features on the cover renowned international private banker Boris Collardi. In an exclusive interview with the magazine, the Julius Bår chief executive officer talks about the Swiss private bank’s plans for its Bahamas operations as it celebrates 35 years in the country. Initially established as a safe haven for European funds during the height of the Cold War, the Bahamas branch of Juilus Bår has grown to be a full service bank, providing a raft of wealth management and other financial services. Also stealing the headlines in this issue is the continued rise of the multi-billion dollar Baha Mar resort on Cable Beach. Already commanding the New Providence skyline, the resort and residential complex is set to open later this year. In the lead feature of the Business section, the executive team of president Sarkis Izmirlian, chief architect Mike Hong and chief interior designer Dianne Wong discuss the creative process behind the project’s development. As The Bahamas continues to look to tap new markets, the development of new innovative financial services products is high on the agenda for the government and the private sector. One such product is the ICON. Bahamas Financial Services Board chief executive officer Aliya Allen explains the thinking behind the product in her article at the top of the Investing section. Aimed at Brazilian high-net-worth individuals in particular, the BFSB chief describes the ICON as the “perfect product” to target the funds driven Latin American markets. For all these stories and many more, plus the vastly informative Investor’s Resources Guide, pick up a copy of The Bahamas Investor January-June 2015 issue. Prime Minister Perry Christie said that he regards the Bahamian people as a major asset for the tourism industry. Christie made the comment during an address at a tourism symposium held yesterday at SuperClubs Breezes Resort on Cable Beach.